At Physical Medicine Center, Inc you can expect a welcoming, friendly environment with a staff who truly cares about your progress. Our goal is your improved quality of life- that's why our comprehensive treatment plans are designed to help you reach your goals. If pain is holding you back, call today to learn more about our natural, non-surgical, non-drug options for pain relief. 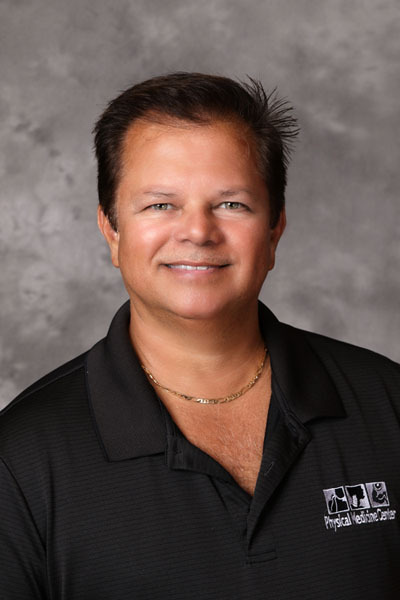 Dr. Robert Lupo is the clinic director at Physical Medicine Center located in north Tampa near the University of South Florida and New Tampa. Physical Medicine Center is a multidisciplinary medical center that offers Medical Care, Chiropractic Care and Physical Therapy. Dr. Lupo attended Life University in Marietta Georgia and graduated with a Doctor of Chiropractic degree in 1985. Dr. Lupo has taken post graduate education in chiropractic orthopedics, neurology, spinal disc injury care and in auto accident and injury care. Physical Medicine Center also offers massage therapy, treatment for dizziness and balance disorders, Spectra cell nutritional blood analysis, bio-identical hormone replacement therapy for men and women and offers the nationally known Medifast weight system. Dr. Lupo and his staff specialize in the treatment of lower back pain. We are dedicated to the highest quality care directed towards one objective…helping as many people as possible achieve relief and correction of low back pain and associated leg pain. We take our time with our patients, and try to blend traditional treatments with new alternative methods and latest breakthrough technologies. Our facility offers a pleasant atmosphere with attentive staff. No detail is overlooked when it comes to your back pain. Spinal Decompression has revolutionized the care and treatment of herniated discs, sciatica, disc degeneration and failed back surgery. We can now help patients who, prior to Spinal Decompression, face living a life of dangerous pain killing drugs, suffering with pain and the possibility of surgery. Patients come to us from all over the region to receive our non-invasive, non-surgical treatment for low back and neck pain. Many patients have found with us the results they are looking for when other treatments have failed to give them relief. You can be our next GREAT REVIEW! Come in and see Physical Medicine Center for pain relieving treatments.